Books, crafts, recipes, rants, Link Logs. Links from the long holiday weekend, as many as possible…Categories: Animals, Books, Crafts, Food (Yum), Global Warming, Vaccinations, Women’s History. Posted a few years ago, and recommended because it’s still a fun read…especially for those of us currently getting bleak November-type weather, who may want to read about Australia. A whole batch of guaranteed tasty vegan recipes…not all gluten-free or sugar-free, but most easily adapted. Steve Milloy shared this link with the note that it smells like cronyism. I’ll add an apology…this NYTimes link worked, but displayed a truly obnoxious warning that they think they can afford to “stop supporting” my browser. It’s your job to keep your site reader-friendly, guys. If you don’t work with my browser and with a lot of browsers that are older and lower-memory than mine, go ahead and self-destruct by losing readers; see if we give a flip. Your writers can find better publishers. Confession Time : Did You Know This About Me? Feds beware…the Hammonds have ever so much more potential popular appeal than David Koresh , Rodney King , or Randy Weaver . And the young seem much more restless than my generation were back then…maybe because the Welfare State hadn’t totally destroyed the economy, back then, so nearly all of us were focussed on doing our jobs! Are any farmers reading this? Y’might want to invest in another mule! Y’know…I think the whole idea of trying to measure global temperatures may be flawed. It’s just too weird to read that an El Nino (Spanish: lower-case, would mean “the little boy”; upper-case, means “weird weather”) year, in which my part of the world set records for cold winter weather, for heavy snow sticking on the ground for weeks and deep freezes and mass deaths-from-freezing of wildlife that normally survive our winters, followed by a very long and mellow spring and a very mild summer and a mild, slow autumn, was “the hottest on record.” Mercy, Maud, I want to shout, where were you? 1986 was a hot year. 1987 was a hot year. 2015 was a cool year…where I was. Even if the cheaper kind of mercury-based thermometers were literally blowing their tops if placed on sidewalks in Baghdad. Steve Milloy shared this NYTimes link (you’re warned; sorry if it crashes your browser) as a joke, with the suggestion that certain “researchers” are planning to fabricate the weather reports that’ll make 2016 seem even hotter than 2015. Well…if you crunch honest numbers in certain ways, you get any kind of statistical results you want. That’s not exactly news. To the extent that El Nino is a weather pattern, it seems to be followed by a backlash some call La Nina…this web site will know that that’s true if we’re cooking on the sidewalks of Kingsport next summer, while Baghdadis parade around in long-sleeved shirts in July. And La Nina may be approaching. Here it is the day before Thanksgiving, and although I have turned on the heater in the office room, I left it turned off when I headed out in the T-shirt-dress I’m wearing now. The ground froze last night and the night before, but thawed into squidginess in the afternoon sun–it’s squidgy outside by now, and not uncomfortable if you step outside without a coat and move briskly. …makes him sound either less intelligent or more un-American than he is, which, I believe, is really trop fort. It is convoluted, and unlikely enough to remain hypothetical, but, for young Twits who haven’t been following the issue…ISIS is part of the general craziness in the Middle East, as was Al-Qaeda, as was the P.L.O. The craziness in the Middle East is caused by too many people wanting to own land that contains oil, even though it doesn’t contain enough water for all of them to live on or near it. Reducing the global demand for oil would (a) reduce these people’s desire to live in the same place and (b) reduce their ability to amass lethal weapons to fight over it. (See Bill Maher ‘s When You Ride Alone You Ride with Bin Laden , although that was meant to be controversial entertainment too.) In theory, if we all wanted to get serious about using less petroleum, it would dampen all the craziness in the Middle East. Maybe even dampen the land and give people living there access to a decent quantity and quality of water. That is, of course, postulating that if you or I walk to the post office somebody else won’t drive to the post office, drive back, and then insist on offering us a lift to the post office, thereby doubling his petroleum consumption and offsetting our reduction of the same. Anyway, the President wasn’t saying that solar panels will stop bombs. They won’t. He knows that. All people our age know what he meant. He simply expected that youall had heard all of this explained over the past fifty years, too. Lots of food-related links today…everyone must be thinking of Thanksgiving dinners! Categories: Animals, Books, Crafts, Food (Yuck), Food (Yum), Fun Stuff, Reader Feedback, Technology, Writing. Another book review at Blogjob. This unusual, unlikely scenario is the one the gene splicers seem to think reflects the real world…anyway, this painting will remind you of The Less Fortunate, for sure. How “Kung Pao Chicken” recipes have travelled around the world…(yes, the link says “General Tso’s Chicken,” but the article is about “Kung Pao Chicken”). Gluten-free people sometimes cook omelets instead of pancakes. What about egg-free people? Why not an egg-free pancake? The mathematical madness behind Alice in Wonderland ‘s Tea Party, that is. Malware issues didn’t even leave much time to go through five days’ backed-up e-mail. Here’s what I found so far. Categories: Animals, Food (Yuck), Food (Yum), Phenology Links, Politics, Privacy, Travel, Writing. “Yesterday, officials in the Obama Food and Drug Administration (FDA) shocked Americans by opting to approve GMO salmon for human consumption here in the United States, where 90% of the population favors GMO labeling. This deeply flawed and irresponsible approval is an outrage and means that the first genetically engineered animal will soon be on the shelf in grocery stores and restaurants across the country. And because of current U.S. law, these newly approved GMO Frankenfish will appear on your plate without you knowing it due to a lack of mandatory GMO labeling laws here in the U.S..
Help stop Monsanto’s desperate plan to kill states’ rights to label GMOs! – Tell your Senators and the President: “I support GMO labeling!” Every voice counts! Tragically, Obama’s approval of AqauBounty’s genetically engineered salmon was done using only the company’s own shoddy scientific studies, which were so poorly designed they wouldn’t pass a 5th grade science fair. For two of the studies submitted, AquaBounty used sample sizes so small that they have no scientific credibility, with only 12 fish tested for one study, while another study on possible allergic reactions in humans involved only 6 fish! Despite this scant evidence, the FDA approved AqauBounty’s GMO salmon anyway. Seriously? This is so irresponsible it should be illegal! Unfortunately, if everyday people like us don’t stand up, we will soon be forced to eat these untested GMO Frankenfish because there are no laws that require mandatory GMO labeling. Even worse than this new approval is the fact that yesterday, Politico reported that your Senators are close to a deal on possibly selling us out on GMO labeling once and for all. Right now Monsanto lobbyists are scrambling to get your Senators to support efforts to kill GMO labeling and preempt states’ rights so food companies can avoid mandatory GMO labeling. Categories: Animals, Art, Bizarrerie, Food, Google +, Muslims, Phenology, Photos, Poetry, Psychology, Thanksgiving Day, Writing. +Sandy KS shares fun facts about an ugly but interesting animal. Peter Streep shares a painting by Pieter Saenredam, an obscure Dutch artist whose style seems ahead of his time. How I’m getting referrals from this site is anybody’s guess…could it be because I’d said, more than once, that the word “honey” in modern U.S. usage is so vulgar, so often, that it should probably be considered unprintable? Oh well. Nobody minds the cute, innocent little bees, and the bees at this Blogspot “hive” seem busy indeed. What are the hidden dangers of visiting online “mobile recharge sites”? When you exchange your cell phone number for recharge minutes from a web site, how many nuisance calls are you signing up for? I don’t know. I can’t even afford to check this out. If someone out there wants to check it out and report back, I’d thank them. And here’s the inimitable Vladimir Putin…I agree with the +Allen West Republic assessment. Totally. Would you pay $6 per month to join a spice club? I like this beef-and-vegetable soup recipe. I like okra. (1) Computers are business tools. If you want people to hang out on social sites, you pay per post. That’s the secret of the relative success of all the other alternatives to Facebook. (2) Business tools should never call attention to themselves. If you want people to use a web site when they’re not being paid to use it, you never, never, never change a button that was working, and you avoid adding clutter or screeching, clashing background colors. (3) Personally, the reason why I backed away from Google +, where I was connecting with some e-friends I’ve missed, has been that I’ve switched from mostly using public-access desktop computers to mostly using a privately owned laptop computer. Google + is one huge mess of memory-hogging graphics. Some laptops won’t open it at all. And as I read that more people are buying even cheaper and flimsier “tablets” and using phones for their Internet activity, I think I’m onto something. The way to “revitalize” Google + might begin with offering a graphics-free version. Bill O’Reilly wants a “Million Muslim March” to condemn ISIS. Morgan Griffith wants Saudi, Egyptian, Jordanian, and other Muslims to join us in a war against ISIS. For quite a long time, I’ve wanted just to link to articles or review books in which Muslims denounced ISIS and/or the Taliban and/or al-Qaeda…good luck, gentlemen. Brigitte Gabriel may have a point, much as I hate to admit it. If the peaceful majority are afraid of offending the loud lunatic minority, then the peaceful majority may be irrelevant. And, while we’re here…I think Muslim drivers who refuse to deliver beer…should own their own independent outfits, if they like, but not take jobs driving for companies that handle beer. Scott Adams discusses the psychology of late adolescents (ages 15-30) in ways that probably just won’t make sense to anyone under about age 20. Let’s just say I agree with him about the rationalization process; all of us humans do a lot of the things we do for reasons we don’t completely understand (I don’t usually eat when I’m sleepy, but often eat when I’m thirsty) and then, if asked why we did those things, we invent reasons that don’t actually account for what we’ve done. Big-chain stores get the message: Don’t open on Thanksgiving Day. Here’s a site that delivers a word and a quote (not related) per day. E-friends from AC, please don’t drive +Lyn Lomasi completely around the bend, but…she’s built her site up to Real’Zine status and can accept a few guest posts and/or applications. Hurrah! If any of us deserved to reach this point first, she did. Categories: Animals, Boys & Girls, Censorship, Movie Stars, Politics, Writing. Some links and comments about Gardening & Farming are being scheduled for Sunday. Some men, young sisters. Only some men. I’ll never dispute that being willing to kill the rotten ones is an asset when it comes to finding the precious ones. (And curbing the rotten ones, too–some of them may eventually outgrow their current rottenness.) Women should, like men and like the United States, not start a fight and not lose a fight. But seriously…I’ve met a few jerks too, but what I really wish were different about men is that the good ones are so fragile. They die so young. They’re so precious that even if they’re ninety-nine years old, when they die, that’s still far too young. I agree with Jason Howerton, and apparently many of the students: hatespeech is not a crime, and shouldn’t be treated like one. However, in view of the crimes that were probably triggered by hatespeech and have been reported at this campus…is it appropriate to summon the campus police to watch in case a crime does occur? In my home town, Gentle Readers, you can be arrested for “public drunkenness and disorderly conduct” for using, on the street, some Washingtonians’ favorite words. The assumption is that if a Virginian is in mixed company and uses the F-word or the S-word, or arguably even “Hell” in a sentence that does not refer to Michigan, he or she is probably drunk. And y’know, although I oppose censorship… not only do I not feel that this needs to change, I feel that printable-but-obnoxious words like “honey” and “lousy” should be added to the list. Lots of working people have violent fantasies about their bosses. If the said bosses ever go into politics, nobody is surprised when the said working people declare their support for the opposition…or even for the said bosses. Well, I voted for Ralph Nader, and people who’ve worked with him campaigned for Terry Kilgore, but they are men you don’t meet every day. So I wasn’t terribly upset to read that a former employee of hers said he wants to strangle candidate Carly Fiorina. Or that opposition candidate Hillary Clinton laughed, even. But Jason Howerton has a point here. Remember how the Democrats screeched and carried on when Republican candidates said much less inflammatory, nonviolent things…? This cartoon post is about drawing, actually, but it’s relevant…When I get halfway through writing something and realize that I’m bored, I take that as an indication that other people might agree that it’s boring. It might need revising, or re-thinking, or recycling into the compost of my mind. This, of course, is a useful policy only for the more “creative” type of writing. Fiction readers might not want to read a story about a four-year-old watching baby chickens scratch in the yard. Blog readers might not want to read a post about an old textbook I have for sale, even though somewhere out there is somebody who used that book in college, lost or sold it, misses it, and wants it back. But no matter how boring a post about reviews of baby buggies on Amazon may be, the only reason why I started to write such a thing is that somebody out there is paying for it. So, while trusting my intuition that most people would agree with me that that post is painfully boring, I just push on and finish it…and the handful of people who wanted it to be written are delighted. This one started yesterday, but wasn’t posted because Blogjob shut down. Categories: Animals, Economy, Education, Food (Yum), Holidays, Music, Obamacare, Politics, Phenology, Politics, Technology, Thank a Veteran. Kellogg’s is phasing out eggs from miserable, short-lived battery hens . Want to lean on General Mills, too? Hillary Rodham Clinton pulls a 180 on the question of charter schools, although the schools themselves aren’t reported as the problem…Some public schools are very good schools. I attended one. Still, no school can afford to batten on a monopoly, the way the public schools did when I was a schoolgirl. Even at good schools, monopolies foster outright child abuse. Students need to be able to vote with their feet and maintain an incentive for teachers to do their best work. And once again, my home town was a battleground for school choice in the 1980s, and once the battle was won and the Gate City Christian School opened, the public school principal agreed that having an alternative served the public school well too. Children study better and behave better when they have a choice between different school atmospheres and teaching styles. Some children who were chronic problems at one school did well at the other school, so the benefits of choice were mutual for the public and private schools. This is a fan site, not maintained by the singer himself…Gordon Lightfoot is still planning an overseas tour next year? Fantastic! Personally, I suspect that any large-scale plan to base anything on an insurance gambling scheme is doomed to implode. Today’s phenology, here? You didn’t want to know. November rain…somehow it seems perfectly appropriate that a document I need for another paid writing site is on Blogjob, and Blogjob is down. (Update: November 10 has been sunny and chilly.) So, in some places today’s phenology is more colorful. Fantastic foliage found in Scotland. Publius Huldah gets controversial. Furiously controversial. First, General Motors is sponsoring an effort to install adaptive technology in the homes of 200 selected veterans with major disabilities. #gmc fundraises to give disabled veterans “smart homes.” (ASL sign “house”) Click https://ourbravest.org/enlistme to help. Categories: Animals, Fun Facts, Nature, Pictures, Politics, Writing. Twitterers, do you, too, suspect that the original Ben and Jerry wouldn’t have needed to be told that God gave cows tails for a reason? Not phenology, exactly…Maria Popova picks Goethe ‘s brain and reprints five (English translations of) poems about clouds. Here’s a belated phenology photo. 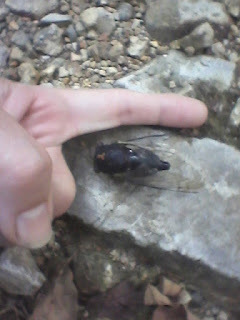 I snapped this Annual Cicada’s picture in September but didn’t e-mail it to the computer until I e-mailed Wednesday’s doll picture…no extra charge for uploading it now. Jonah Goldberg explains the difference between conservatives and libertarians. Can any creative work remain independent of sponsors? Well…I have a nice ad-free Blogspot blog that I’ve maintained for years, and there’s been no online response to its “Last Post?” I’ve worked with the assumption that at least equal numbers of the Blogspot’s regular readers like it and hate it. (Blogspot reports these things; I know for sure, and have known since the first few months of the Blogspot, that some regular readers do hate it.) Maybe all of them hate it. I received complaints that people weren’t able to comment on the Blogspot using the regular Blogger comments system. I installed Disqus for those people. Still no intelligent comments. So, nobody’s getting paid to interact on Blogspot/Blogger/Google+, so evidently nobody wants to interact there, so hosting the nice ad-free (and computer-memory-friendly) Blogspot is a waste of time. Too bad; it’s been fun and all that. I logged into Blogjob hoping to see lovely content-supportive Prosper Ads, and what I saw was an obnoxious pop-up “personalized ad” from Amazon. Icky. But I do see evidence that people are reading the Blogjob posts. Announcement: Some clients find it hard to understand the concept of writers having real lives. I just told somebody I’d be available to add a link to an article today. Somebody went ahead and put in the request for a change yesterday, when I’d said I wouldn’t be online. So when I came online the system had automatically deleted the request. Sigh. I had planned to work in that link today, instead of spending time drawing out haters and encouraging fellow introverts at a teen-oriented web site. I will not be online sixty hours a week this week. Sorry. It doesn’t mean I don’t liiike youall any more. It doesn’t even mean I don’t need some payments for some existing writing that have become past due. It just means that, in order to move, as planned, to a location nearer home where I should eventually be more available online, I have to spend some time moving objects around in the real world. And I can’t even commit to a schedule; this all depends very much on weather. This web site likes bush beans, and, when we buy beans in tins, we also like Bush beans. I actually think this article offers some good suggestions…if it’s read with a mature understanding. The story I shared, encouraging said mature understanding, triggered all sorts of displays of hostility and conceitedness from extroverts. Go on and out yourselves, haters. I’m concerned solely with sending empathy vibrations to all the wonderful young introverts out there. Yes, I’m seeing evidence that youall are reading my web site; thank you (for reading), and you’re welcome (to continue reading). And, if any extroverts are reading this…yes, I did say that self-accepting introverts learn to love youall, if we do, more in the way we love dogs than in the way we love our close friends. Try not to take it to heart (she says, feeling really chuffed by the hatespews from people who might otherwise have gone on representing themselves to Christian students as friends and mentors, and who are So. Not. Helping.). You do, as a matter of scientific fact, have different and in some ways inferior brains. But most introverts I know love our dogs (and our friends’ dogs). What appeared to be the site’s official resident troll called my comment racist. Because I identified the annoying person in the story as a White girl? Well, she was…and there are reasons why that fact sticks in my memory: (a) I’m legally White myself, so entitled to mention other people’s Whiteness if I feel like it; (b) I am in fact biracial, and at that school, where all but two of the other summer kids appeared to be either White or Black, I was constantly and excruciatingly conscious of it; (c) the precise way in which she was considered funny-looking is an irrelevant detail that should probably have been left out, but it was a White way, and (d) I was especially aware of this on that day because I’d already been overtly harassed by one of the Black teen-trolls. That’s a different story, so there was no need to specify that this was the attack by the White girl, but that’s how I remember it and how I wrote it. I was tired at the time. A better thing to call the adolescent Priscilla in the anecdote would have been “clumsy” or “adolescent,” which of course I was…only a year or two ahead of the dateless girl. However, where my anecdote failed was that people who didn’t go to church schools apparently didn’t get the picture. That child was not interested in actually being kind to me. This was not just “My date didn’t show up either, so would you mind very much sitting next to me while what I have in the way of friends snog and I try not to cry from self-pity”; it was a gambit that sucked me in because I mistook it for that innocent, “My date didn’t show up either” type of thing. She was interested in trying to boost her own social status, from which extroverts get their self-esteem, at my expense. And yes, as distinct from things like my brother’s recent death, which made me feel primarily sad, and the culture’s sick attitudes toward young women, which made me feel primarily righteous, this petty little incident where I walked into a social trap did make me feel exclusively, unrighteously, helplessly and childishly angry, at the time. I wanted to share that–with strangers? yes, y’see introverts are not necessarily shy–because I’m quite sure that the arrogance of “I don’t actually like you, but I’m donating a little attention to you as an act of charity because you’re such a pathetic loser” would paint a target on the back of anybody who takes that approach to an incipient homicidal maniac. Actually being friends with the ordinary, nonviolent, non-psychotic, harmlessly lonely young people who are out of step–gifted/backward, tall/short, fat/skinny, mature/baby-faced, rich/poor, pimply, clumsy, sickly, dealing with an unusual amount of emotional anguish at an emotional-anguish-ridden stage of life–is of course a good thing. It may be what some of them need to stay off drugs, and to grow up to be the wonderful human beings nature intended. It cannot be faked…I’m feeling frustrated, at the moment, because I am all in favor of actually appreciating people who are likely to be “less popular” in college. Before working overtime to become “Queen Bee of a Popular Clique” I was one. And so were the friends who made up that group, which was what made it such an awesome experience for us and so infuriating for the extroverts who were welcome to hang with us but just didn’t fit in. Instead of any “Wonderful Me, Pathetic You” garbage, or even our previous year’s “I had a friend I really liked but s/he’s not around this year, waaail,” about a dozen people reached across the demographics and found enough in common to be friends. Which happened to include that we were earning our own money and could therefore afford to have enough fun to make the children of rich, indulgent parents realize that they weren’t the only Popular Clique in town. So I agree that the clumsy geek in your class may be the richest and best looking person at your class reunions, and if you like him, you may live to be glad that you became his friend before he was cool. Which is a valid reason to become his friend, if you get the chance. If somebody is just hanging onto life while the post-traumatic stress of past bullying fades (the way I was in middle school), that person may not want a friend–yet–even if that person likes you later on. If somebody is out of step because he or she genuinely is different from you–maybe the one musician in a crowd of tin-eared scientists as in The 400 Eels of Sigmund Freud , etc.–then that person may feel obliged to be kind to you, but not accept you as a friend. Even if that person eats lunch with you, s/he will be continually reminded that you are at best a nice associate, but not a real friend. And if somebody just feels like an adolescent social misfit, “here’s a crumb of attention from Wonderful Me to Pathetic You” is guaranteed to exacerbate that feeling…and if the person receives the wrong kind of “help” and develops a violent psychosis next year, guess who’s likely to play a leading role in his or her pseudomemories. Categories: Books, Christian, Communication, Funny, Pictures, Politics, Race, What?. The funniest thing about this comparison of gender references in different novels is that, in Chesterton, I don’t mind. He lived in a Victorian gender-segregated world, and wrote about men living in that sort of world, with only an occasional passing reference to Father Brown hearing an occasional female confession. That we don’t have equally good novels by and exclusively about women (Alison Bechdel is not, in my judgment, equally good) indicates an imbalance, although anybody might correct it any day. That all the characters in Chesterton’s novels are male, and/or that all the novels are more about human activity than about human personality, tells me something about Chesterton, and it makes some of the novels less enjoyable than others, but it doesn’t offend me. Uh-oh. I don’t text often, and when I do it’s usually to people at least as old as I am, so I doubt this has become a problem. However. For the record. I am a writer. I think in complete sentences. If those sentences don’t end in question marks or exclamation marks, they end in periods. (Online, they may also end in smileys, winkies, or frownies.) When I add a period in a text message, the meaning is “Yes, I finished what I was saying before pressing ‘send’ and/or starting another sentence.” I don’t think text messages are good ways to express emotions, but if I were to send a ticked-off text, the expressions of anger would be ALL CAPS and/or exclamation marks and/or frownies and/or expletives (e.g. “dang”) identifying what I’m most angry about. More hide-and-seek graphics: The Language Log captured this photo of William Campbell’s paintings of pathogenic microorganisms. The actual story is at Reuters but, when I read the story, I don’t see the photo. If there are any circumstances under which you’d vote for Ted Cruz (my reservations are based on (1) the “birther” faction and (2) my Carson/Paul preference), you might want to take this survey. President Obama made another serious mistake…and it’s possible that somebody at Townhall.com has finally got the point; for the first time in years I was actually able to read a story there, online, firsthand. It’s not racism as such…it’s just the way Caucasian-types do think (in spite of good intentions) unless, and until, they’ve lived in places where Whiteness is not the norm. (And sometimes it’s the way militant spokesmen for other ethnic groups have told us to write, draw, and stage, as well–the assumption that we wouldn’t know how a major character who wasn’t White would think. Shakespeare could imagine a Black man in Italy because he could count on any non-British members of his audience to be quiet if Othello seemed too easy for Brits to relate to.) I spent a long time in the non-federal parts of Washington, D.C., where the default assumption is that Blackness is the norm, so I believe that simply taking it as understood that all the interesting characters are going to look like you is a human imperfection rather than an act of hate. (When I write fiction that’s set in a place like Washington, if a character’s physical look is not specified, you may visualize the character as you like.) But in a story about a modern U.S. city, if the story goes on very long or has more than two or three characters, making them all the same color is a way a story loses credibility. At school, at work, in an apartment building, there’d be a mix.